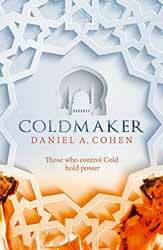 Coldmaker (2017. 327 Pages) is the debt novel of Daniel A. Cohen. Given that the protagonists are, for the most part young I’m guessing that the book is aimed at the young adult market. For a first novel the book is good, but it is not without its faults. Initially my feeling was that the location felt too isolated with no context with which to place it in this world. At the beginning of the book we see Micah plying his trade as a messenger. This gave the author a perfect chance to paint the city in vivid colours, but I did not feel that this was wholly successful in putting you in the place. The problem of the action happening in one place is that you don’t get a feel for the rest of the planet or how the city could survive. After the first fifty or so pages Cohen does start to fill in some of the detail of the city’s immediate environment which gives a better idea that there are other places for his character to go and different things to see. Micah is an engaging character and through his eyes we are introduced to the slave owning city. Cohen takes the time to introduce ancillary characters which places Micah in a context. Following this Cohen then starts to introduce other characters similar in age to Micah In the form of a young wild girl and a disaffected nobleman. Central to the main issue I had with the book was the description of the ‘Cold’. We are told that following some great catastrophe, which in the book is couch in religious terms, the world became so hot that the only source of ‘cold’ was that which fell from the sky. This cold comes in many forms such as frosts and wisps. Here I had to struggle as cold is a relative concept, not something you can hold in your hand, but the central idea of cold quickly becomes an ongoing deus ex machina, pretty much behaving in a overly malleable way to help keep the plot moving. I’m not saying that I didn’t like the book, I just think that the cold and what it was, is not fully explored or explained leaving the reader struggling with a concept which runs counter intuitively to their everyday knowledge. Even given its faults the book remains well written, the central characters, especially Micah have a satisfactory story arc which leave our hero very different at the end of his partial journey. The world building improves as the story develops, however, it has to be said, that this is not a self-contained story as the end is obviously constructed to facilitate a series of novels. This is not unusual, but as a first time novelist if this book does not sell well there is no guarantee that you will ever find out how the story is going to resolve itself and that would be a shame.